A step by step guide for creating and publishing a report on your mobile divide only. Articles are also available for creating on desktop only, and in a combination of desktop/mobile. To create a new Report, Click "New"
Fill out the Inspection Details, and please note that the address and zip code are required fields. Be sure to select which Template and which Agreement you would like to use for this Inspection. Once you've completed this page, Press "Save Inspection." You will be directed back to the Dashboard page. If the inspection you just scheduled is for today, it will show up on this page. If it is in the future, click "All" at the bottom to find it. 6. 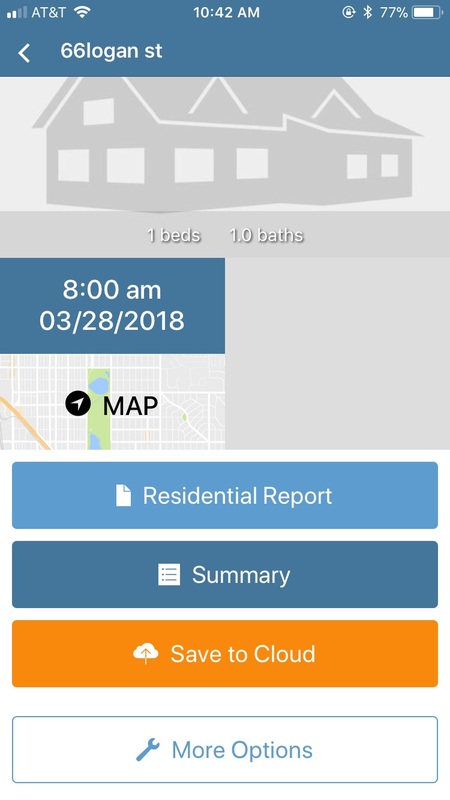 To edit the report click "Residential Report." 7. The "Summary" button will show you all the defects for the report. 8. When you are done editing your report, be sure to select "Save to Cloud" or "Save" depending on what your Live Syncing settings. 9. Clicking More Options will give you the option to "Edit Inspection Details" "View Report" and "Publish." 10. Clicking "Publish" will send out the email that you set up under Automations. 11. Clicking View Report will also show you the little PDF generating button on the right hand side of the screen if you'd like a PDF version of the report.